The following is an excerpt from OpinionJournal.com’s “Best of the Web” written by the editor, James Taranto. “[Barack] Obama had always had a high estimation of his ability to cast and run his operation,” the New York Times’s Jodi Kantor wrote in her 2012 book, “The Obamas” (quoted here by National Review’s Jim Geraghty). “I think I could probably do every job on the campaign better than the people I’ll hire to do it,” then-Sen. Obama told job interviewee David Plouffe in 2006. “I think I’m a better speechwriter than my speechwriters,” he told another job candidate, Patrick Gaspard. “I know more about policies on any particular issue than my policy directors. And I’ll tell you right now that I’m gonna think I’m a better political director than my political director”–namely Patrick Gaspard. 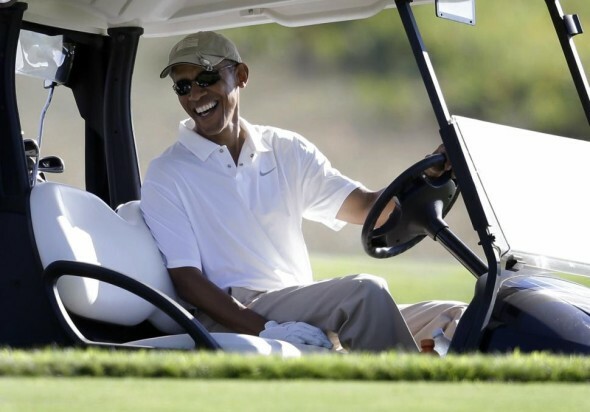 President Obama golfing on Martha’s Vineyard right after his speech about ISIS and beheaded American photojournalist James Foley. “Because of the Republicans’ extreme politicization of this issue, the president believes it would be harmful to the policy itself and to the long-term prospects for comprehensive immigration reform to announce administrative action before the elections,” a White House official said. “Because he wants to do this in a way that’s sustainable, the president will take action on immigration before the end of the year.” . . . Administration officials insist that Mr. Obama is more determined than ever to take action–eventually. But the president and his top aides have concluded that an immigration announcement before November could anger conservatives across the country, possibly cripple Democratic efforts to retain control of the Senate and severely set back any hope for progress on a permanent immigration overhaul. . . . The president and his team believe that waiting until after the election season is over will allow him to unveil sweeping and sustainable changes to the immigration system that could potentially shield millions of illegal immigrants from deportation and provide work permits for many. For a critical discussion of the plan’s legal, policy and political merits, we commend today’s editorial in The Wall Street Journal. For the purpose of this column, we’d like to focus on the bizarre nature of the report itself. What the Times describes is an attempt to deceive the electorate. The president’s planned executive action is thought to be unpopular, at least among swing voters in states with competitive Senate races, so he will not undertake it until after the election, when there’s nothing those voters can do to express their disapproval. But wait. Doesn’t such a deception require secrecy? The Times’s sources are remarkably specific about the timing of the prospective “sweeping” action, which they say will occur sometime between Nov. 5 and Dec. 31. Although they quoted anonymously, there is little reason to doubt that they speak authoritatively on the president’s behalf. In short, the information in the Times article ought to be sufficient to dissuade the voters in question from casting ballots for Democrats. In contrast, the anonymous officials in the Times story were quite straightforward. They must be assuming that the news will not be widely disseminated among the voters in question–that they can place a story in the New York Times without its having much reach beyond the political class, including the immigration activists they hope to reassure. That seems an insult to the voters’ intelligence, though one cannot rule out the possibility that the assumption will nonetheless turn out to be accurate.